Google Launch the Monitoring Tool for Dengue Fever in Indonesia ~ " World Information "
Jakarta - Google announced Google Trends dengue, surveillance tools for tropical disease caused by dengue virus, or if in Indonesia known as dengue fever. This service has been launched in 38 languages ​​and 5 countries, including Indonesia. Dengue Google Trends provides estimates close to real time about the activities of dengue hemorrhagic fever (DHF) to track the popularity of a particular Google search words, thus helping the public and health officials to prepare for outbreaks of dengue. Dengue is a virus that spreads through mosquito bites that cause symptoms such as high fever, severe headache, skin rash and mild bleeding. This virus infects more than 100 million people worldwide each year. Meanwhile, according to the Directorate of Animal Disease Control Sourced (Dir P2B2), Ministry of Health of the Republic of Indonesia, in 2010 and Indonesia has the highest dengue cases in ASEAN with 150,000 cases and 1317 people die from this disease. There is no vaccine or specific medication for dengue fever so that public health efforts, especially focused on helping people to take precautionary measures so as not infected by this disease. Usually need time to collect, analyze and provide information on dengue cases to the public through health information resources from various institutions. Dengue With Google Trends, the people of Indonesia is expected to be online at any time to track the latest dengue activity in Indonesia. Because updated every day, Google Trends provides an early indicator of dengue on dengue activity, even before the official announcement submitted. Dengue Google Trends uses the same methodology as Google Trends Flu, other surveillance equipment that uses a combination of Google search data to predict flu activity around the world. Every week, millions of users around the world do a search online to obtain health information, and Google has found a close relationship between the number of people who do a search related topics DBD with the number of people who actually have symptoms of dengue fever by using the official estimates. In remarks quoted on Sunday (06/05/2011), Google recognizes if not every person who searches 'DBD' was really sick. But the Internet giant was confirmed that a pattern will emerge when all the words related searches DBD combined. 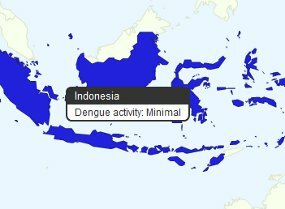 By using the calculation data of DHF cases provided by the various Ministries of Health and World Health Organization, Google can create a model that offers a near real-time estimation of dengue activity based on search terms related kepoluleran DBD.